2018 WGI Championships Media Coverage Sign up! Much like previous years, we will be in full force at WGI World Championships in Dayton, OH with our very own Pedro Rodriguez and media team! 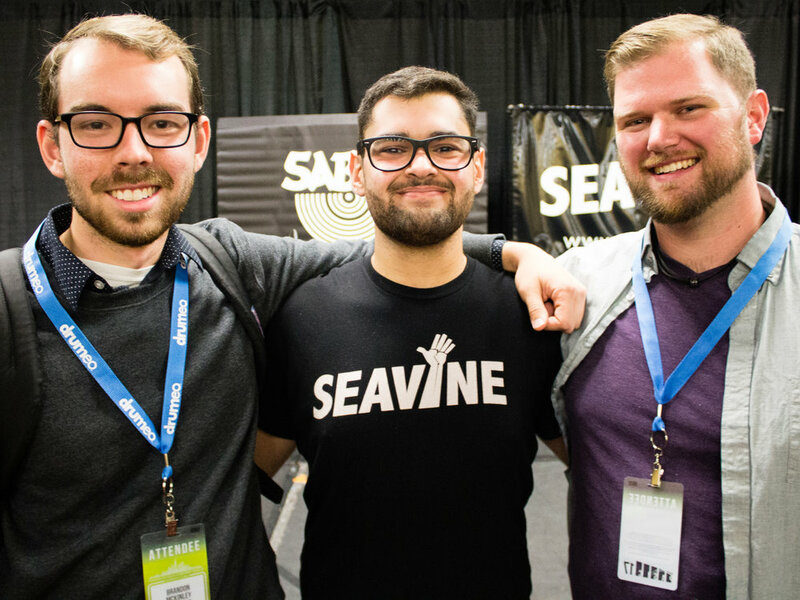 To make sure we get coverage of as many cymbal lines as possible, we are looking to double check our list of performing groups using Seavine products this winter. If you and your group are wearing The Cymbal Gloves or our other products please fill out the form below. We only need one person from each group to fill this out! ***If you see one of our media team members in your lot, please help them get the best spot possible to record you! Thank you! We hope to catch you in the lot! PASIC Clinic a Huge Success! 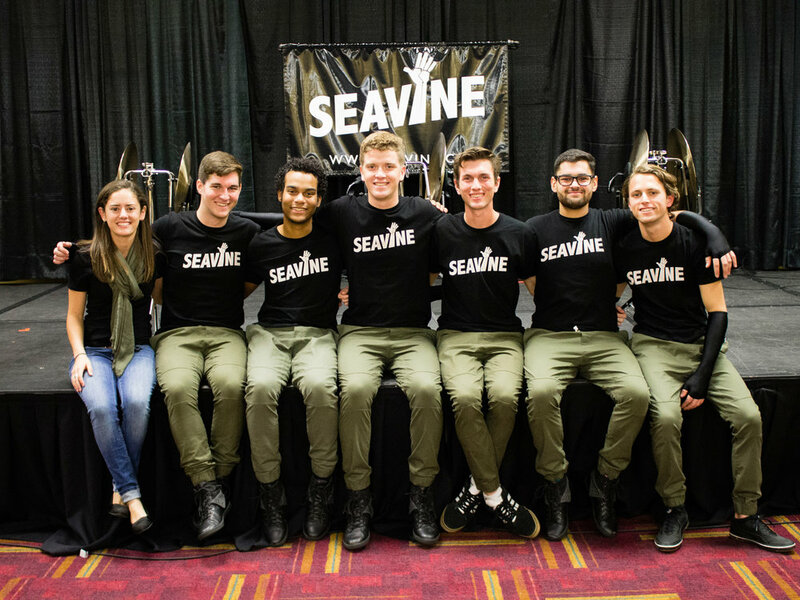 On Friday November 10th in Indianapolis, Seavine made history at PASIC presenting the first known marching cymbal clinic! 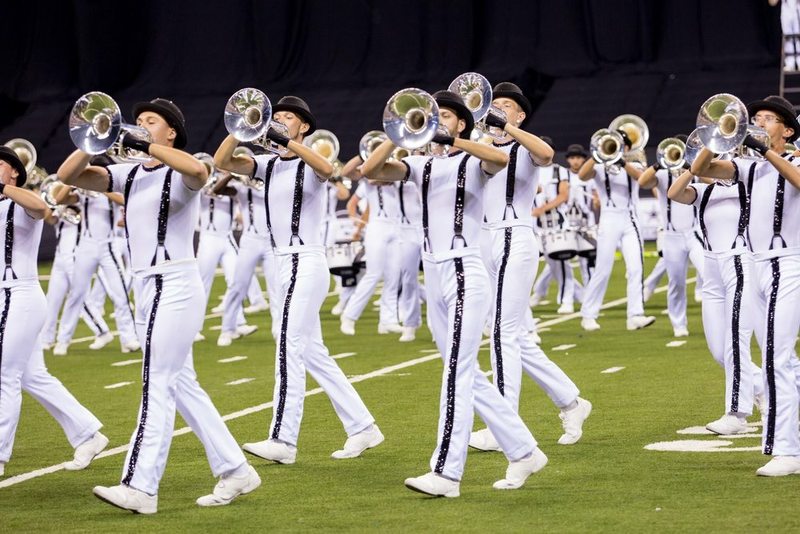 With the help of the Rhythm X Plateline and Drumset Player Zachary Hudson, Chelsea Levine gave insight on how to best implement and teach a marching cymbal line. In the session they went over topics such as parallels of cymbal basics to other battery instruments, cymbal technique, and how to incorporate music and visuals into a production. "This was a very unique opportunity to publicly express some overlooked functions for cymbal lines, and how they can positively influence the show as a whole," Christopher Carlin of the Rhythm X Plateline said. 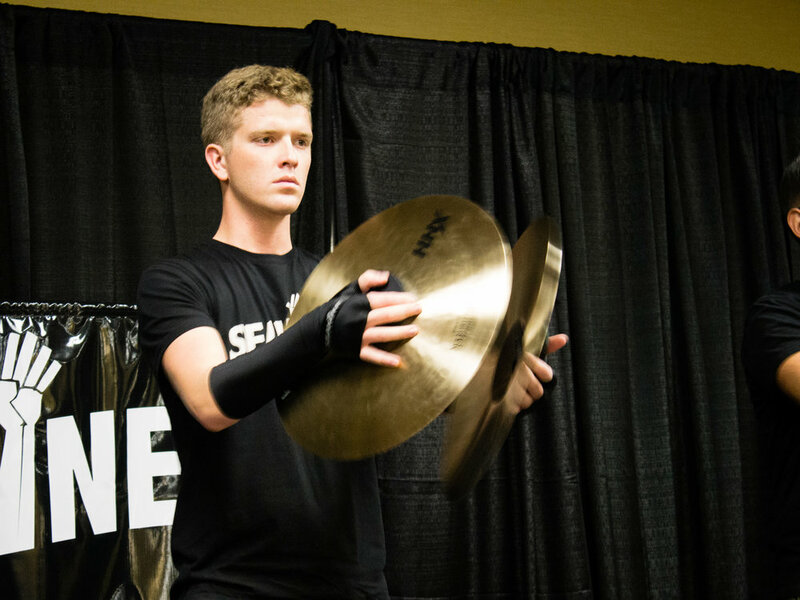 "Being included in a PASIC clinic was an exciting view into the educational side of the percussive arts," second year Rhythm X cymbal player Adrian Amegashi said. "This year was the first PASIC and I hope to be able to take part in future cymbal education clinics to spread the obscure art." We also took this opportunity to hold our first live stream via Facebook. The clinic entitled, Designing and Marching for Modern Marching Cymbals was viewed far and wide with views counts approaching 4,000! If you'd like to watch or rematch the clinic yourself head here or go to our Facebook page. We caught up with Alex Huizen, three year member and ageout of RXP after the clinic. 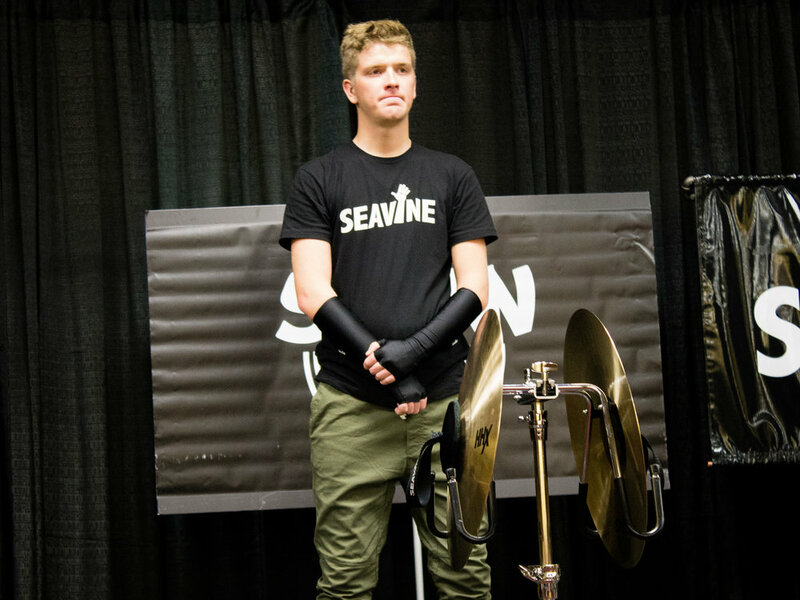 "Being a part of the Seavine marching cymbal clinic was a very rewarding experience. Providing visual aid to educators hoping to further develop their programs cymbal line made me feel hopeful for young cymbal players. I spoke with young aspiring marchers after the clinic about cymbals and my journey as a cymbal player; encouraging them to never give up on their dreams." "I'm extremely humbled by the turn out and feedback from the PASIC clinic," Chelsea said. "I look forward to future opportunities to help spread cymbal education to anyone who is interested." If you or anyone you know is interested in hosting a clinic or learning more about cymbals send an email to info@seavine.co and we'll help anyway we can! Once again thank you to PASIC, SABIAN, Rhythm X, and Lot Riot for all their help with the clinic! 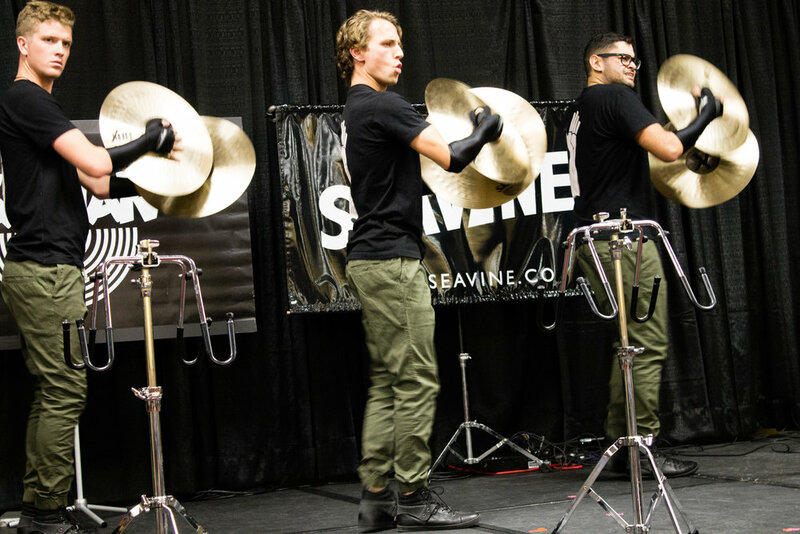 Seavine goes to PASIC with the Rhythm X Plateline! 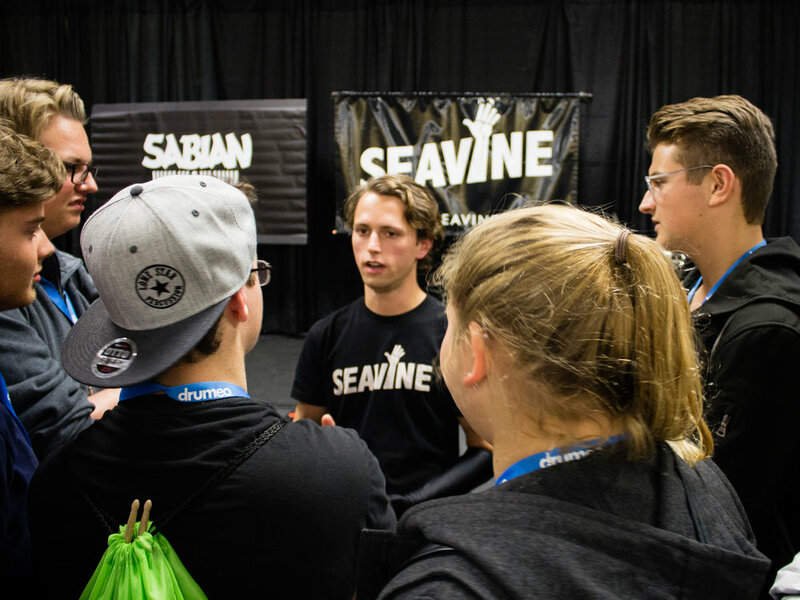 We are excited to announce that Seavine owner Chelsea Levine will be presenting a clinic at PASIC 2017! This clinic is a year in the making and she couldn't be more excited for the opportunity to come to fruition. The clinic is entitled, "Teaching and Designing for Modern Marching Cymbals" and will include the 2017 Rhythm X Plateline and Drumset player as the demonstrators. This educational opportunity will be geared towards band and percussion directors who may not have a cymbal tech or cymbal experience. The goal is to give educators and designers the confidence they need to successfully and effectively field a modern marching cymbal line. Chelsea, with the help of RXP, will go through various training exercises for their foundation of technique as well as their ideologies of music and visual writing. Huge thank you to PASIC, SABIAN Cymbals, and Rhythm X for helping make this happen. If you're interested in learning more about cymbals come check out the clinic on Friday November 10th at 4PM in room 205 of the Indiana Convention Center. We are proud to announce the Bluecoats Drum and Bugle Corps are using The Hornline Gloves by Seavine for the 2017 DCI season! When we were approached by the Bluecoats to help outfit the hornline with their new uniforms we could not have been more excited. With a fresh new look for their production of Jagged Line, Bloo contemplates the nature of contrast and variation through four iconic artists never afraid to explore the possibility of divergence. The Bluecoats we all know and love have a reputation for pushing the envelope and not being afraid to innovate within the marching arts. With larger than life props, hip music, and uniforms that no one has ever dreamed to be so cool, we are thrilled to be teamed up with such a prestigious organization. To learn more about #Bloo17 head to www.bluecoats.org or on social media here. The Blue Devils join Team Seavine with The Hornline Gloves! We are ecstatic to announce that The Blue Devils Drum and Bugle Corps are spearheading DCI with The Hornline Gloves by Seavine this summer! Discussions for this partnership have been a year in the making. To see the corps perform on the field with our products is immensely humbling. "Seavine Hornline Gloves and this exciting relationship are a wonderful addition to the BDPA family. The gloves look great, feel great, and can hold up to the intense daily demands of a top drum corps. And our designers love the freedom and ability to customize colors and prints to fully realize the corps' look with any given program.” says Justin Heimbecker, CEO of BDPA. With their 2017 production, Metamorph, The Blue Devils show the transformation of the marching activity through music, design, and costuming and where it’s going. Our helio colored Hornline Gloves are a hip addition to their diverse 2017 uniform. For more information on The Hornline Gloves head to: www.seavine.co/hornlinegloves or send an email to info@seavine.co. To follow BD on their summer tour give them a follow on social media or check out their website!